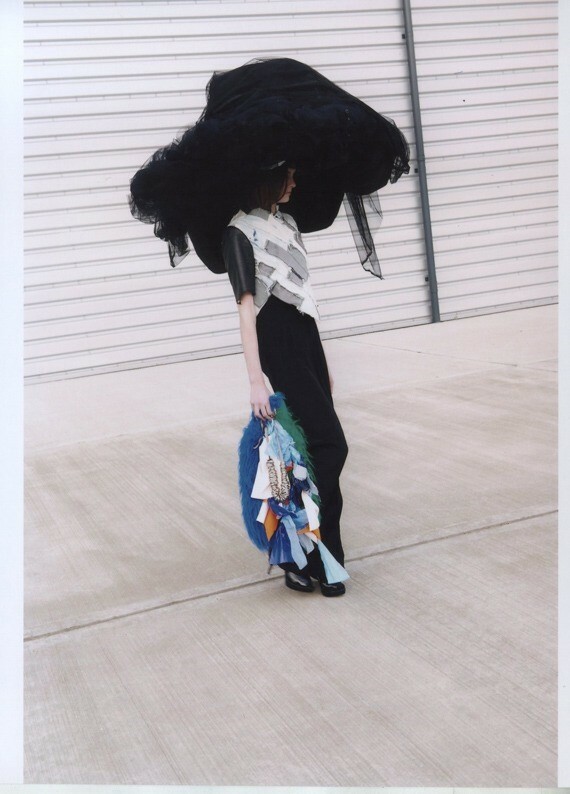 Yusuke Maegawa is a Japanese womenswear designer whose characteristically dark and voluminous designs caught the eye of many fashion editors after having shown in Central Saint Martins’ graduate fashion show in 2010. Subsequently, Maegawa was one of the designers featured in last season’s Vauxhall Fashion Scout exhibition. Known for being a leading platform for design innovation, it is no wonder Maegawa fitted seamlessly in the showcase’s line-up. Exploring various fabrics and textures, Maegawa’s work is testimony to his resourceful ingenuity. His silhouettes are a juxtaposition of shapes that model an intellectualized femininity built upon the well-established Japanese aesthetic, yet moving towards his own individual signature. Dazed Digital found out how his collections take form. Dazed Digital : Your signature is the mixing of different fabrics and textures. Is that how you start off – by looking at materials? Yusuke Maegawa: Fabrics are always key in my collections, but, normally, I start with doodling designs on blank paper. I try placing fabrics and colors on it, to have a vague image of the final outcome. At the same time, I do the toiling solely with white cotton to keep my mind open for material and colors. I usually decide about color and fabric in the last stages of my design process. I always try to be very cautious about choosing fabric and how to manipulate it. DD: What materials do you find the most interesting to work with? Yusuke Maegawa: Japanese fabrics. They’ve been popular in recent years, but they still have so much more potential. Japanese manufacturers have an overwhelming desire to explore new techniques and better themselves. I find it especially interesting to work with synthetic fabrics such as polyester, as I love pleating. DD: Your pieces have been used on men as well as women. Do you consider yourself primarily as a womenswear designer? Yusuke Maegawa: Actually, many people have asked me if my clothes are for men during the exhibition, and I’d love to see my clothes on men, but that is not my deliberate intention. I do consider myself a womenswear designer and I always have a woman in my mind when I design. DD: What kind of woman? Yusuke Maegawa: A woman who seeks out something new. Someone who would wear something different, which doesn’t mean something odd. She is strong and understands social consciousness is needed to be different. DD: Would you say there is something distinctly Japanese about your designs? Yusuke Maegawa: I think so but I cannot point out what exactly. Objectively, I think the color palette I use, my silhouette, and the way I approach the woman’s body, come from Japanese culture and the rawness of my work has something in common with Japanese street style. DD: What in your style is different from other Japanese designers? Yusuke Maegawa: First of all, I did my all fashion study in the U.K. In addition, back in Japan I was an Americanised kid. I loved Stussy, Nike Airmax and Tommy Guerrero with a passion. Then I discovered the fantastic collections of Margiela through Japanese TV and he became a fashion hero of mine. I was 13 and I didn’t even know Rei Kawakubo or Jun Takahashi at the time. In that sense, how I grew up is the same as European kids of my generation. So, my style is a bit more exotic to the Japanese somehow, as I look at fashion with half European eyes.